A pedal powered blender for making smoothies at festivals and events had always seemed like a great idea. It brings in a number of concepts: firstly there is the ‘we don’t need electricity for everything’ idea, secondly it helps to demonstrate the concept of power in a interesting and practical way, thirdly it helps to promote cycling and lastly it helps to get people to eat more fresh fruit. An amazing book for human powered devices, which includes a pedal powered blender plan, is ‘The Human Powered Home’ by Tamara Dean and published by NSP. A nice Instructables plan is available here. DISCLAIMER: These instructions are given as a guide for the competent pedal power enthusiast. The authors do not take any responsibility for any injury or damaged tools which may occur. Please stay safe when using power tools. Consult a qualified person if you are unsure at any stage. You are responsible for your own safety. A pdf of these plans is available here. This is also available from the great instructables website. 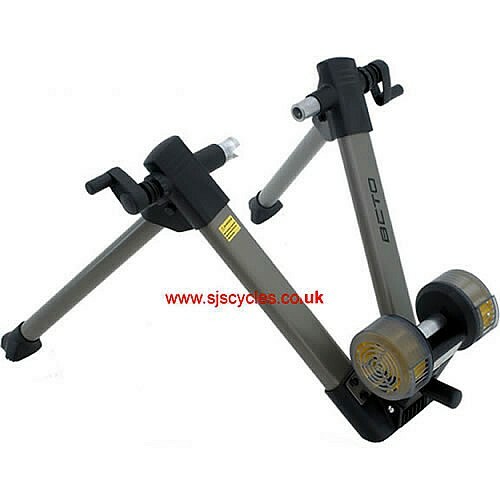 Bike ‘Turbo’ Trainer – We used a stand manufactured by ‘Beto’. Search eBay for ‘Turbo Trainer’ and you can pick them up used from around £30 (if lucky) and new from around £50. Flexible drill drive – from Screwfix (code: 31843) for £14.95.http://www.screwfix.com/prods/31843/Drill-Bits/Drill-Accessories/Flexible-Drive-Shaft-915mm. Or use the slightly longer version (1300mm) from Wolfcraft (shown here). An old blender or smoothie maker – we were lucky to find a unit with a damaged motor for free. If possible find a unit which has a broken motor. Check car boot sales, freecycle, ask friends etc. An ‘Optics’ type clamp – This is the screw clamp which holds ‘Optics’ drinks dispensers to a shelf. These are usually available at car boot sales. Otherwise a woodworking G-clamp could be used. Approx 50mm x 50mm angle aluminum – a piece around 20cm long, around 2mm thickness. The ‘Turbo Trainer’ is basically the whole stand and wheel attachment, so not that much work is required here. The trainer has a large threaded rod with some small ‘cups’ which hold each side of the back wheel nut of any bike with a wheel greater than 26”. It’s pretty quick and easy to get a bike attached to the stand. Ensure that the stand is well tightened and the lock nuts used. A roller pushes some yellow plastic fans against the wheel. This provides the resistance for the ‘training’ but is not needed here. With the fan removed we want to attach the flexible drive to the roller assembly. The flexible drive shaft is connected using a small piece of metal tubing and is held in place using two angle brackets. The angle brackets will be bolted to the plastic roller assembly. To fit they must be cut down slightly and an additional hole drilled. The brackets must be bent slightly so that it holds the flexible drive in the correct position – in-line with the roller drive axle. This can be done by holding the bracket in a vice and tapping with a hammer. The flexible drive is held in place with two jubilee clips. The roller axle is connected to the flexible drive shaft using a small piece of tubing as a coupler. The shaft sizes are not equal so a number of layers of heat shrink are used to build up the diameter. Build up layers of heat shrink. Ensure you cut off any excess. Do this on both the roller assembly and the flexible drive. The coupling tube must be attached to both the axles. To do this, drill a small hole through the tube and the shaft. We used a 2mm hole. A short piece of 2mm galvanised wire pushed through the hole and bent on each end. A split pin or bolt could also be used. On the final version an additional piece of large diameter heat-shrink was used to hold the galvanised wire. A guard made from metal mesh was added to keep interested fingers away from the moving parts. This was made from a piece of square section mesh which was cut to size using some tin-snips. This is shown here, where you can also see the two jubilee clips which hold the outer casing of the flexible drive. The mesh is cut to size and then ‘wrapped’ around the metal brackets. Small holes (3mm) were drilled and tapped (given a thread) with a 4mm tap in the angle brackets. This means a machine screw can be used to hold the safety mesh onto the angle brackets. The next step is to convert the blender, so that the flexible drive can be easily attached to spin the blender blades. We found a blender which the motor had burned out, hence it seemed OK to remove and get it working again on pedal power. We used a Kenwood Smoothie Machine, but I am sure that most blenders have similar insides. SAFETY: Unplug the smoothie maker before taking it apart. Firstly take off the blender jug and keep safe. Unscrew the plastic base. This gives access to the motor and the blender shaft. Make sure you keep all the nuts, bolts and screws, as they might be required later. You can remove the cable and any of the electrical components as they will not be required. The connector from the blender base to the blender jug was a plastic saw-toothed connector. This was held with a nut, but on a reverse thread. Turn this the opposite way to the usual to undo (clockwise to un-tighten, rather than the usual anti-clockwise). It should undo quite easily. This will allow the motor spindle to drop out. Undo the two screws holding the motor to the plastic base. There are large, heavy motor windings around the motor spindle. These can be removed. The motor is held at the top and the bottom with two bearings. There may also a fan at the base. This can be removed by undoing the nut holding to the spindle. Undo the two nuts on each side of the motor assembly. The next things to remove are the motor brushes. These are two graphite connectors which provide power to the windings on the motor spindle. These are not needed, so just undo any holding screws and remove. Once the motor windings have been removed there is nothing to hold the top and bottom sections of the motor apart. We used some metal tubing (4mm brass tubing) to replace the motor windings. Measure the distance and cut two identical pieces of tubing. Fit over the two long bolts (as shown) to replace the windings. Note: If weight is not an issue, then you can just use the motor windings again, rather than cut additional tubing. Re-build the motor assembly, ensuring that the motor spindle turns freely on its bearings. The concept is to tighten the flexible drive chuck around the protruding motor spindle. The flexible drive chuck opens to 8mm maximum, just larger than the smoothie machine spindle. Note: If the spindle is larger than the chuck, then you could use a metal lathe to machine off the 2mm, but this is not practical for most people. A metal file could also be used to flatten off three sides to create a triangle. Check the flexible drive first – the spindle might fit with no adjustment. Now that the main parts are built then last thing to do is to make some kind of clamp to hold it to a table. There are loads of ways to do this, we have built machines which are permanently bolted on table tops and ones which clamp to a table. How you do it is up to you, but here are the table clamp plans for your information. We used a piece of 50x50mm angle aluminium to hold an old smoothie machine. The whole unit is clamped to a table top using a clamp from an old ‘optics’ type drinks clamp. This makes the unit portable so it can be rigged up anywhere. The photo here shows that a piece of aluminium angle has been cut so that it fits around the motor. The motor is bolted to the aluminium bracket and the plastic housing of the smoothie machine. The plastic housing must be cut down using a ‘Dremel’ type cutting tool, so that the angle aluminium extends outside of the housing, as shown above. Bolt using 4mm bolts and use lock-nuts so that it does not come undone with vibration. On the other end of the aluminium bracket a clamp is bolted. Drill two holes through the aluminium angle and the clamp. Use short bolts and locknuts to bolt together, as shown here.